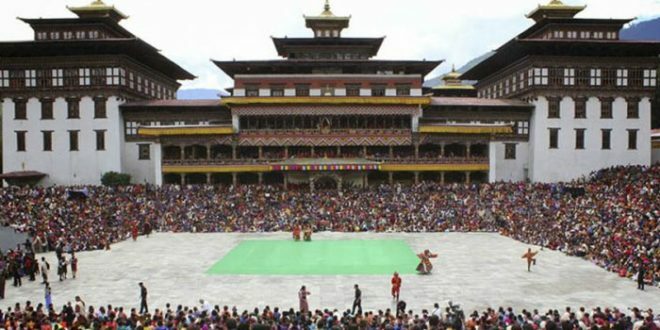 Although the latest report from the World Bank on Bhutan’s economy acknowledges that Bhutan’s economic performance has remained strong over the years, the report, however, also suggest that there are lot to be desired in consolidating and furthering Bhutan’s development. The report states that delays in hydropower construction and decline in electricity generation hampered the economic growth of the country, and the estimated 5.8 percent growth for the Fiscal Year 2017/2018 could have been higher if not for the hydro delays. It is however, noted that the services growth remained positive, which are primarily driven by financial services hotels and restaurants. Economic growth is projected to average 6 percent a year over the medium term, largely supported by ongoing hydropower projects and the services sector, especially tourism. With the completion of the Mangdechu hydropower project tentatively by the end of this year, exports are likely to increase in FY 2019/20, while imports are expected to decline because of lower capital goods imports for hydropower projects, as well as overall lower public investment, narrowing the current account deficit to 12 percent of gross domestic product (GDP) by FY 2020-21. Since the new government is yet to revise the budget for the FY2018-2019 and endorse the 12th FYP, the findings suggest the government increase productivity growth in the agricultural sector as it accounts to about 60 percent of employment in the country. In addition, it has also been noted that in absence of a robust private sector, vibrant job-creating private sector remains a longer-term challenge, and the transition out of farming into more productive jobs is likelyto happen at a slow pace. 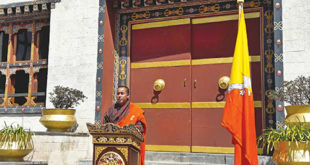 As per the report, the four key risks facing the future of Bhutanese economy are- consistent delay of the hydropower projects which will hamper revenue earnings and decrease export; constrained development spending which will negatively affect future growth and development given the limited donor financing; policy uncertainty after the 2018 general election could affect growth and investment; and the uncertain weather pattern with the climate change could negatively affect the economy through lower electricity generation from existing hydropower plants and the regulation of the tourist inflows by the government. “Available statistics suggest that economic growth in FY 2017-18, which is projected at 5.8 percent, decelerated from the 7.4 percent growth rate registered in FY2016-17. Delays in hydropower construction and a decline in electricity production, combined with international tourist arrivals negatively affected growth,” states the report. The number of international tourists, excluding the regional tourists in FY 2017-18 was 59,000. 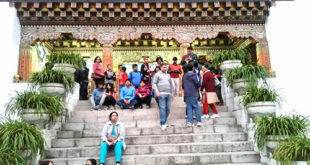 The report states that towards the end of FY2016-17, Bhutan offered a special package for Koreans which raised the number of Korean tourist arrivals. Overall, the number of international tourists in FY2017-18 was almost the same as in the previous year, as the decline in Korean tourist approvals was offset by the increase in tourist arrivals from other countries. However, the performance of the manufacturing sector remained positive, whereby the domestic sales increased by 17 percent, and exports rose by 21 percent. Unlike in the first three quarters of FY 2016-2017, the total sales values of major manufacturing companies, such as food processing and carbide increased by 19 percent during the first three quarters of FY2017-2018. The trade deficit declined by 6 percent. Exports of goods increased by 3 percent and service exports by 19 percent. The remittances earned through RemitBhutan, a platform to facilitate non-resident Bhutanese to remit their savings to their personal foreign currency account with an authorized bank in Bhutan, have also significantly increase from Nu 1.3 billion in FY 2015-16 to Nu 2.5 bn in FY 2017-18. This has helped in the national saving and building foreign reserves of the country. 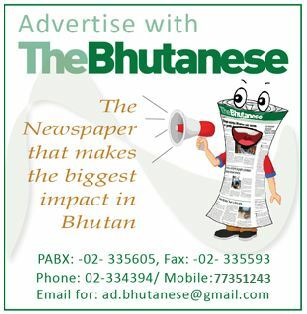 The Royal Monetary Authority launched RemitBhutan towards the end of the year 2016. Latest figures show that the country’s gross international reserves stand at USD 1.1bn, of which Rs 20.5bn constitutes the Rupee reserve. And as per the mandates of the International Monetary Fund, Bhutan’s current reserve is sufficient enough to absorb potential future external shocks-equivalent to 10.9 months of imports of goods and services. “Despite recognition of the importance of FDI by the government, and various initiatives to encourage more inflows, FDI has been limited and volatile. In the first three quarters of FY 2017-18, net direct investment was Nu 0.2 billion, a significant increase compared to net outflows of Nu 0.8 billion during the same period in the previous year,” the report states.